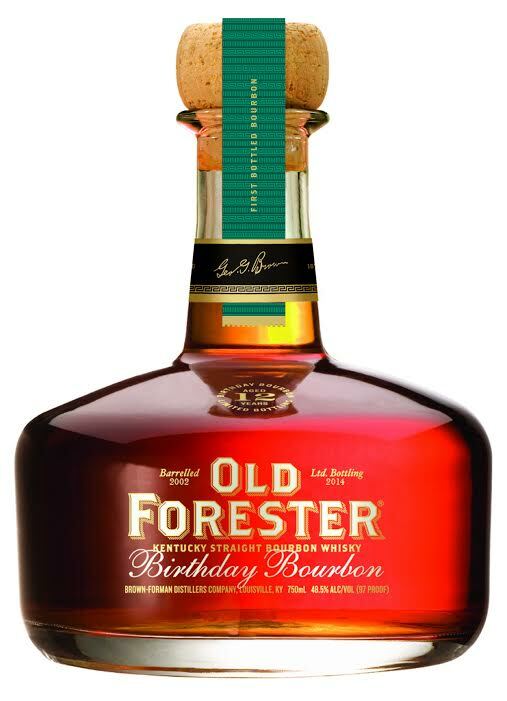 Another year, another “birthday bourbon” from Old Forester, a brand that still seems to be a bit under the radar (an increasingly rare thing). Chris Morris, Brown-Forman’s Master Distiller wants you to know, “Old Forester is the only bourbon still in existence today that was produced before, during and after Prohibition by its original distiller.” And now you know. This is their thirteenth annual limited release, celebrating founder George Garvin Brown’s September 2 birthday. Last year’s version had a phenomenal nose, but the rest didn’t quite live up to the lovely aromas. This year? Same idea on what’s in the bottle, all distilled on one day 12 years ago. Similar proof (down from 98 to 97). A slight bump up from $55 to $60 recommended retail price. The color looks a bit lighter to me than last year, more golden. The nose is similar to last year’s, though not as noteworthy in its richness, and maybe a touch less balance than last year as it leans a little hot. Toasty oak, caramel, vanilla, and some peachy fruit. There is a bit of maple here, but not much in the way of cinnamon/spice. Neat, there’s a woodiness to this one at first, a bit dusty, and the cinnamon comes in pretty quick and lingers long. Last year it brought to mind the cinnamon-dusted, candied almonds that they sell at ballparks or street festivals – and this year I think the cinnamon is even more intense (despite not being very present on the nose). Again, nice stuff overall, but it still feels a bit off balance and slightly harsh, for a 12 year old bourbon under 100 proof. Ice brings out the brown sugar in the nose in a very nice way, and accentuates the peachiness as well, with some bitter orange mixed in. It does indeed make for a more lush feeling while sipping, but still not as harmonious as I’d like it to be until it starts to approach watery. There’s a fine line here where the ice and bourbon reach the perfect equilibrium, but it’s fleeting. Thirsty South Rating: Good Stuff* – it’s a very nice way to celebrate a birthday, but not a party I’d go out of my way for. I like the fact that Old Forester keeps turning out these limited releases, but wouldn’t mind seeing them play around with the age and proof a bit to seek out something that stands out from the pack a bit more. At essentially at the same price, there is no way i would buy or gift this over Blanton’s. Chuck, I’m with you on that. Your review says It’s a bit harsh for a 12 year at 90 proof. Actually it’s 97 proof, and to me it’s one heck of a taste with a splash of water . Just saying. K.M. – good catch, thanks, I must have had 87 proof in my head rather than 97. Fixed.